New robotic fish unveiled by Japanese scientists will allow long extinct species to be recreated. The robot models of modern fish are so lifelike that only closely inspecting the eye tells them apart from the real thing. The four-year project at Mitsubishi Heavy Industries (MHI) cost $1million and the company expect the technology will be used in virtual aquariums. 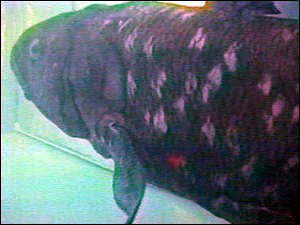 They have already created a robotic replica of the rarely-seen coelacanth. They intend to recreate fish which died out millions of years ago and are known only from fossils. "If this technology disseminates well enough, the cost could go down and we might have them in the entrance hall. But, at this point, I cannot say that is happening," said Yuuji Terada at the submarine builders, MHI. Mr. Terada believes there may be spin-offs for the company's main business: "The idea of this fish fin movement could be applied to realize the difficult technology of submarine hovering." MHI's expertise was stretched to the limit to develop the fish. Dozens of tiny sensors around the tank transmit messages to the fish, telling them where to swim. The messages are sent from a computer. The first robot, a sea bream, weighs 2.5kg (5.5 pounds) and is 50cm (20 inches) long. Its top speed is half a knot (0.9 kph). The battery can keep it swimming for up to 30 minutes. In comparison, the coelacanth robot is a metal monster, weighing in at 40kg (88 pounds) and measuring 120cm (47 inches) long. The first robotic fish, a tuna, swam in 1994 at the Massachusetts Institute of Technology. The engineers there admired the energy-efficient swimming motion of the fish, honed over 160 million years of evolutionary change. They believe robot fish could swim far further than autonomous submarines, given the same amount of battery power. The cyber-fish could then search huge areas of the ocean, looking for sources of pollution or making maps.